Usually at this stage of the ‘Events’ season, it is normal to be hiding under an umbrella. However, not this year! This year everyone is making the most of the heat wave and the World Cup which is an ideal combination and a good excuse to enjoy more pints, such as deliciously cool Frontier and Cornish Orchards. The event diary is packed with fun and summer related occasions throughout July, with more still to come! Taking place in the stunning green hills of Glynde; Fuller’s secured the first large scale music festival for Dark Star at Love Supreme festival in East Sussex. Standing as the ale partner on event, Hophead will be the only cask product available on site. There are few festival sites more idyllic than this one. To celebrate the sport of rowing, Fuller’s are the exclusive beer supplier to all Gorilla Events bars at the five day festival with Frontier replacing Meantime and Hop House 13 as the lager of choice on all bars. Brand awareness has been increased through the installation of Frontier container and pagoda bars. The circuit of summer events takes us back to the South coast again, this time to Paddle Round The Pier for a weekend of thrilling nautical activities down on Brighton’s sea front. 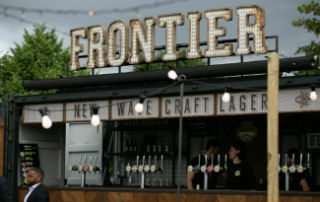 We are excited to have Frontier listed as the exclusive festival lager and have our shacks bars on Brighton beach for the weekend. Set in the heart of the Cotswolds Frontier, there will be a massive visual presence once again down at Cornbury’s fifteenth festival. Last year we sold through 95bbl of Frontier and Cornish Orchards on a relatively wet weekend, if this run of good weather continues through to Cornbury Music Festival we expect to surpass the 100bbl mark! We are very excited to be returning to Brockwell Park’s 44th Lambeth Country show for this traditional country event with a distinctively urban South London vibe. Amongst the live music will be horticultural shows, sheep and owl displays, home grown vegetable and flower competitions amongst a plethora of craft and food stalls. All this and more will be set against an eclectic and diverse range of music to enjoy with your cold Frontier. London Pride is the official beer of the Vitality Hockey Women’s World Cup and we’ll be on site at Fan Central in the Olympic Village serving London Pride, Frontier and Cornish Orchards just a short walk from the action at the Internal Hockey pitches. Big screens showing the action, street food traders and live music will add to the entertainment in fan central, selling pints of delicious Fuller’s beer. The event diary is packed with fun and summer related occasions throughout July, with more still to come!